As the dust has settled on the food tech space in India, there’s little to separate the companies that are still left standing. Zomato, Swiggy and Foodpanda are now slowly becoming indistinguishable — they offer similar selections, similar prices, and even employ similar social media marketing strategies. 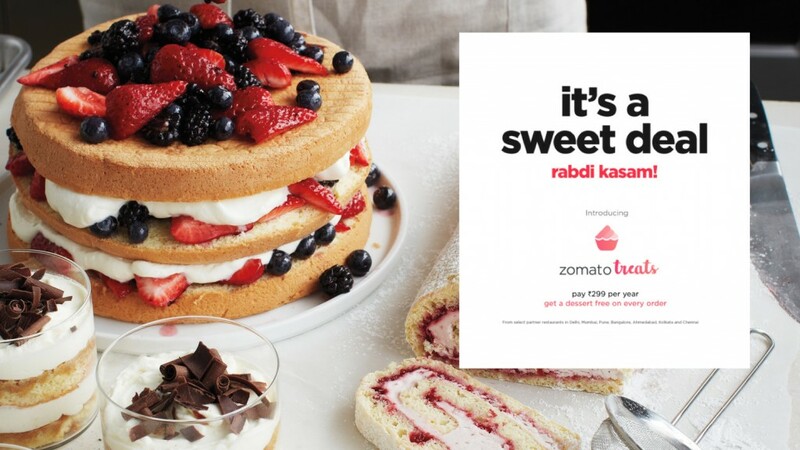 But Zomato thinks it’s found a way to break the through the clutter — free dessert. Zomato is running a loyalty program where it throws in a free dessert each time they order from selected restaurants. Called Zomato Treats, it is live in Delhi NCR, Mumbai, Bangalore, Kolkata, Chennai, Pune, and Ahmedabad. Customers who opt in need to pay an annual fee of Rs. 299, and they’re then entitled to free dessert when they order from a selection of 2,500 restaurants. On the surface, it doesn’t seem like much. Food tech companies regularly throw in discounts and freebies, but Zomato Treats is different — it asks users to pay in money upfront before they can start enjoying the program’s benefits. It’s a tack that’s been used successfully in the past. Amazon Prime, for instance, asks users to pay an annual fee that entitles them to faster shipping. But Amazon doesn’t really care about the upfront fee — Prime is designed to make users order more and more off Amazon, and choose it over its competitors. Amazon had famously run no statistical models when it had launched Prime for the first time, and didn’t know how to price it. Jeff Bezos had settled on a price of $79, based purely on the fact that it felt high enough as to convey that the program was valuable, yet low enough for people to afford. Zomato’s annual Rs. 299 fee feels much like the same. It’s unlikely the company will make money off it — consumers should be able to recover their upfront cost in a few orders. But what the fee will do is incentivize members to order on Zomato instead of its competitors. If Swiggy and Foodpanda offer similar prices and delivery times, but Zomato’s order throws in a free dessert, choosing Zomato would be a no-brainer. Also, there’s this very human need to extract value from an offer that you’ve already paid for — Zomato Treats might actually incentivize users to order more food than before. And the company says it’s managed to draw interest. Within a couple of months of a soft launch, Zomato says it has 10,000 paying customers on Zomato Treats, and has served 80,000 helpings of dessert. That’s already 10,000 people who’re exponentially more likely to order off Zomato over the next year. And as Zomato brings its program to more cities, this number can only grow. Zomato is uniquely positioned to do this — it’s been in the food tech space for a decade now, and is using the relationships it’s built with restaurants to pull off this scheme. With other food tech companies spending millions on Google ads, Facebook ads and discounts, Zomato’s loyalty program might just be the best marketing trick of all.